Planning a trip abroad to Europe? Book an Amsterdam holiday package and get the best airfare and hotel deals in one place. Gone are the days of spending hours browsing multiple websites. Webjet does all the hard work for you by curating specials with leading airlines and top hotels to help you get excellent value for your money. Simply enter your travel dates, choose the perfect deal for your budget, and you're on your way to one of Europe's top city break destinations. Start searching the latest Amsterdam holiday packages from Australia with Webjet's powerful search engine. You can fly to Amsterdam from any of Australia's major cities. Melbourne, Sydney, Perth, and Brisbane all have regular flights departing with some of the world's top airlines. The fastest route to Amsterdam is via Sydney Airport (SYD) with a flight time of 23 hours. However, depending on the airline you choose, your stopover destination can lengthen your journey to 46 hours. You'll land at Amsterdam's Schiphol Airport (AMS). It's the main international airport in the Netherlands and the third largest in Europe. It's only nine kilometres from the city centre, making taxis from the airport inexpensive and there are plenty of cheap public transportation options as well. Amsterdam packages boast some of the city's top hotels and canal-facing apartments. You won't have to worry about booking accommodation that doesn't meet your expectations or one that isn't exactly where you want to be based. Pulitzer Amsterdam is a collection of picturesque canal houses. Stay here, and you'll be near to some of the city's top attractions such as the Anne Frank House, Madame Tussauds and the Royal Palace. The air-conditioned rooms feature ensuite bathrooms, complimentary toiletries and 24-hour room service from the hotel's three on-site restaurants. There's also a fitness centre and additional amenities such as bicycle rental, and babysitting and concierge services. Canal House is one of Amsterdam's unique accommodation options. Wake up every morning with tranquil views of the city, surrounded by luxury decor and the modern finishings. Your room comes with amenities such as iPod docking stations, complimentary WiFi and designer toiletries. The hotel is within walking distance of Westerkerk, the Royal Palace and Dam Square and offers a free buffet breakfast. The Amsterdam Barbizon Palace is a five-star hotel located in the heart of the old quarter. The buildings are converted 17th-century townhouses and a 15th-century chapel. It's a few steps from the city's top attractions as well the bustling Central Station. Inside your room, you'll find a personal Nespresso machine, a premium mattress and stylish decor. Take advantage of the free gym and ask the Guest Relations team to make any tour or restaurant reservations on your behalf. Amsterdam is the vibrant capital city of the Netherlands. It's famous for its picturesque canal network, coffee shops, and intriguing history. It's the perfect city break abroad and has something for every kind of traveller - whether you're on a family trip or visiting the Dutch capital solo. For history-lovers, a stop at the Anne Frank House in Amsterdam is a must. During World War II, Anne and her family hid in an attic from the Nazis for two years before being discovered. Today, it's a thought-provoking museum, and the annex has been preserved to give visitors a glimpse into what life was like for the Franks. If you're visiting Amsterdam during the spring, head out to the famous Bollenstreek tulip fields. 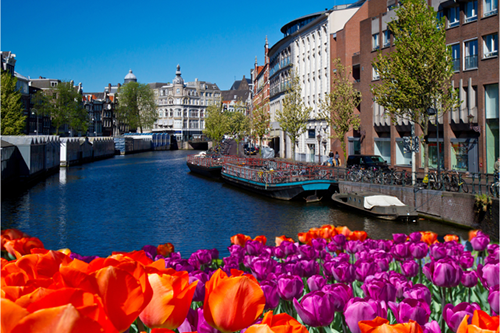 The colourful flowers stretch out across the land between Haarlem and Leiden. But if you're short on time, you can see the flowers at Amsterdam's Bloemenmarket - a floating market on the Singel. Van Gogh is one of the world's most celebrated artists. The museum dedicated to his life's work features more than 1000 paintings, drawings,= and letters. If you're travelling to the city on a budget, grab the I Amsterdam City Card to get free entry into the museum. The best time to visit Amsterdam is before or after the European summer. From April to May and September to November, the city sees fewer crowds and temperatures are mild. But if you're after a deal, book your trip in the winter. You'll find the lowest prices for Amsterdam accommodation and flight packages. Just make sure you bring warm clothes as temperatures plummet to 0 °C. From June to August the city is at its busiest. Hotel rates skyrocket, and you'll need to book well in advance. On the plus side, the weather is excellent, and there's a never-ending list of things to do.